Summer is almost here and berries are beginning to invade the markets. On a recent trip to the market, the eater and I were compelled to pick up some cherries, raspberries, and blueberries. We originally were just going to greedily eat them out of the container, but on the way home I decided that I could concoct a few interesting little mini-tarts. 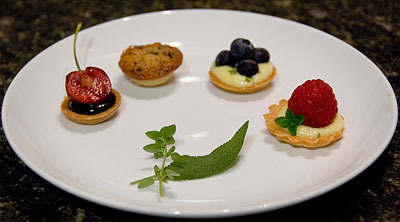 I always enjoy making mini-pastries like these because it gives me a chance to experiment. It only takes a few minutes to bake up the tart shells and only a few more minutes to complete them with your filling of choice. If the experiment is a failure, the investment is small and you don’t overwhelm your tasters; if it is a success, the tasters will be craving for more. The raspberries got paired with some English thyme that is growing on my back deck. 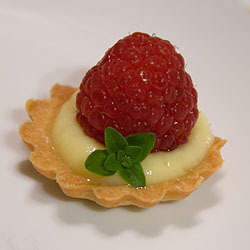 I mixed the thyme into some pastry cream and topped each tart with the biggest raspberries I’ve seen. The thyme gave the slightest hint of herb flavor without overpowering the raspberries. I honestly think I could have tripled the herbs in these and the raspberries would have still been the major player here. There’s not much to these other than cherries and chocolate. 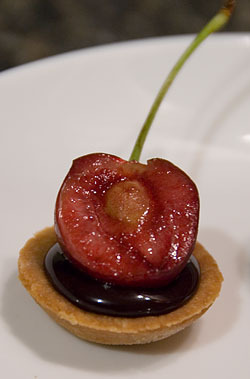 These tarts got a kiss of chocolate ganache that was topped off with a halved cherry. I like to halve the cherry like this so you can see that you are getting the whole cherry, stone and all, and don’t bit down on something unexpected. This was probably my favorite of the bunch; blueberries and sage. The sage was also growing on my back deck. It, too, was also chopped and mixed into the pastry cream. I purposely went light on the sage because it was very strong when I ate a test leaf. These probably could have taken a little bit more sage since there were four berries per tart but they were pretty good just the way they were. The last ones, without a closeup, was a fun mini-cookiepie. 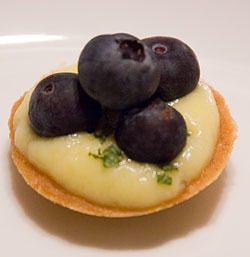 I had some leftover filling that I was saving in the fridge that I decided to use up on a few of these tarts. They came out as expected: small-cookie-goodness. These were an overall success, even if it was just for the eater and I. I think I made twenty tarts total, five of each, I’m sure they will disappear very soon. great site. as always, your work is amazing. Those look pretty cute. The plate looks like a happy face with earrings. I like how you showed the stone in the cherry since these look like you could otherwise just pop them in your mouth. I would go crazy making them though, they’re so small! Those look really delicious. I’m waiting for the weather to cool off so I can try the cookie pies, too.